There are certain dishes expected on Thanksgiving day – mashed potatoes, stuffing, cranberries, and turkey, of course. It just wouldn’t feel like Thanksgiving without these classics, so I’m always sure to have them on my table, but I like to get a little more creative with the vegetable side dishes and this year I’m going to serve grilled Brussels sprouts with a browned butter balsamic sauce. Brussels sprouts get a bad rap, so if you think you don’t like them, I encourage you to open your mind and give this recipe a whirl. Grilling the Brussels sprouts helps them develop a nice crunchy exterior and caramelizes the natural sugars which really brings out the sweetness. There are two keys to success when grilling Brussels sprouts – cut them into uniform sizes so they cook at the same rate and don’t let the grill get too hot, otherwise the sprouts will burn before they’re cooked all the way through. If you’ve never made browned butter before, you’ll be pleasantly surprised by how simple it is to do. Melt the butter over a gentle, low heat and let it cook for a few minutes until it turns golden brown. Be sure to stir the butter while it cooks to help prevent it from burning and remove it from the heat as soon as it starts to brown because it goes from browned to burned in a matter of seconds. Browned butter has a delicious, nutty flavor that takes these Brussels sprouts to another level. Toss the grilled Brussels sprouts with the browned butter, top with toasted walnuts and serve immediately. Happy Thanksgiving! 1. In a large bowl toss the Brussels sprouts with the olive oil, ½ teaspoon of salt and ¼ teaspoon of pepper until evenly coated. 2. In a small bowl combine the shallots and garlic. Set aside until ready to use. 3. Prepare the grill for direct cooking over medium heat (350º to 450º) and preheat the grill pan. 4. Spread the Brussels sprouts on the grill pan in a single layer. Grill over direct medium heat, with the lid closed as much as possible, until browned in spots and crisp-tender, 20 to 25 minutes, stirring frequently to prevent burning. If the Brussels sprouts brown to quickly, turn the heat down to low or move the grill pan over indirect heat to finish cooking. 5. During the last 2 to 3 minutes of cooking, add the shallots and garlic to the grill pan. Stir occasionally to prevent burning. 6. 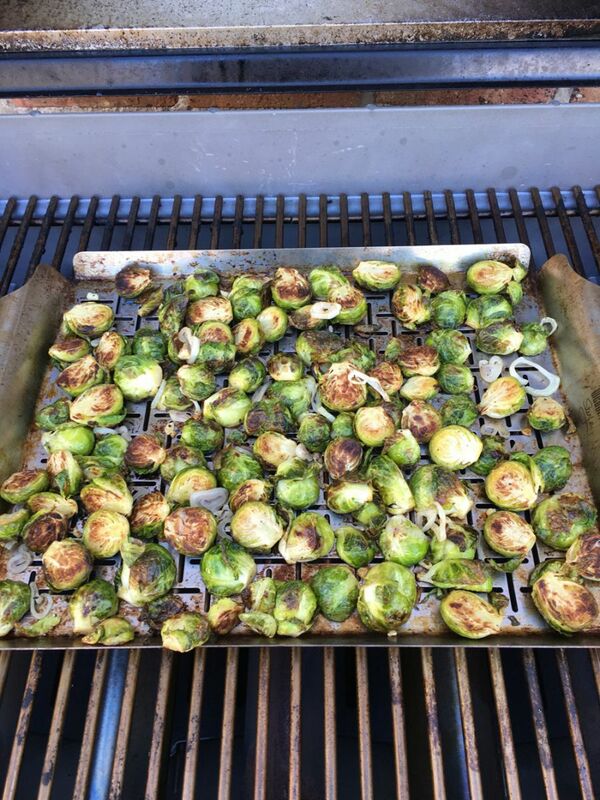 Remove the Brussels sprouts from the grill and cover to keep warm. 7. In a small saucepan, melt the butter over medium heat, stirring occasionally. When the butter turns golden brown and the foam subsides, about 3 minutes, turn off the heat. Let the butter cool for about 1 minute, then stir in the balsamic vinegar and the remaining salt and pepper. 8. Place the Brussels sprouts in a large bowl and pour the balsamic browned butter sauce over the Brussels sprouts. Toss well to make sure the Brussels sprouts are well coated. Sprinkle with the toasted walnuts and serve immediately. Share your #BestTurkeyEver stories and photos with us!